What do you think of the CCFA’s current ad campaign? It centers around the bathroom as essentially a jail for people with Crohn’s & UC. 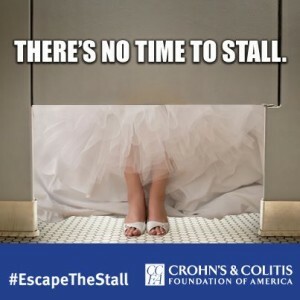 I think it’s one of the few times an IBD organization has really faced the embarrassing truth around what IBD is really all about and I have to give them kudos. Especially because several friends emailed me photos of the campaign when they saw it and just felt compelled to send them to me. It’s a good sign when a campaign is shareable. I don’t think ads like that are in good taste. I think they are demeaning to those to whom that may be a real life moment! While taking action is important, I am not sure this is necessary. Just my point of view.